The year 2017 bade adieu in style with the sensational $52 billion acquisition of Fox by Disney. While the entertainment industry is yet to get past the historical event, 2018 has come up with more promises, bigger expectations and not certainly devoid of risks. The risk in terms of saturation, disinvestments by tiny players, merger and acquisitions, battle among industry giants, production of original content, and more. With 360° videos getting a big thumbs up, VR being widely acclaimed, the tech giants are lauded for their boundary-pushing efforts. So while you sip your coffee, we hereby bring you what more consumers can expect in 2018. Live streaming which was ranked top in 2017 and has yet again become one of the major OTT trends to look out or in 2018. This is not a surprise though as according to a report, live video streaming market is estimated to grow from $30.29 billion in 2016 to more than $70 billion by 2021. Also as per Facebook’s statistics, live video streaming attracts 3 times more viewership than ordinary video playback. So the frenzy among the viewers is understandable. Following the trend, social media juggernauts such as LinkedIn and Twitter have shown an inclination towards live video streaming. 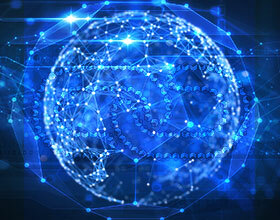 According to industry experts, hybridization will prepare OTT content platforms for the future. Multiple contents from related categories at one place is an excellent formula to improve customer engagement significantly. This, in turn, should contribute toward generating brand affiliation, and subsequently brand loyalty; and would help retain subscribers in the long run. Based on forecasts on OTT consumption pattern, it is highly recommended that OTT content distributors develop a hybrid framework. In 2018, more players in the OTT space will go hybrid and sensitize the consumers to a consolidated ecosystem. Simultaneously, it would also encourage content owners to diversify into more than just one content format. It is not new that OTT providers are betting on 4K and blu-ray quality video formats to outplay each other. Smartphones, laptops, etc. are now being specifically designed to support high-resolution formats such as 4K. While 1080p has almost lost its sheen in 2017, owing to the drastic fall in the prices of 4K TVs and availability of cheaper smartphones that support the format, the reality is not farther when viewers will be categorized into class and viewing class will be defined by the technology called 4K. One big challenge for a content creator is to track its viewer preferences. The challenge also stands tall as text content are churned out innumerably every day, leaving little room for acute analysis of the same. From this, you can imagine how difficult would it be to track the viewer preference for a video content. However, Artificial Intelligence comes as the mega weapon. Nobody is now alien to virtual assistants such as Alexa, Siri, and Google. Through AI, content creators can delve into the video metadata, read through viewership peaks, spot trends like most viewed segment etc. This would certainly help create a better streaming platform and entice viewers. According to a report, sales of VR and Augmented Reality (AR) headsets are forecast to be worth 9.7 billion U.S. dollars in 2020. Also, the latest iPhone X with the augmented reality feature is just a glimpse of where the world is headed. 2018 is going to witness an extensive adoption of AR via ARCore and ARKit. While industry heavyweights such as Apple, Google, and Facebook will be doing colossal investment in immersive technology, 360° videos will pave its way to prominence. The early OTT trends for 2018 also suggests virtual reality making a mark in the movie industry as well. The first of its kind VR centre opened by IMAX in Manchester, England is a classic example to this. Linear OTT services will grow in 2018 and there will be stiff competition among players to maximize their subscription base particularly among millennials and young viewers. 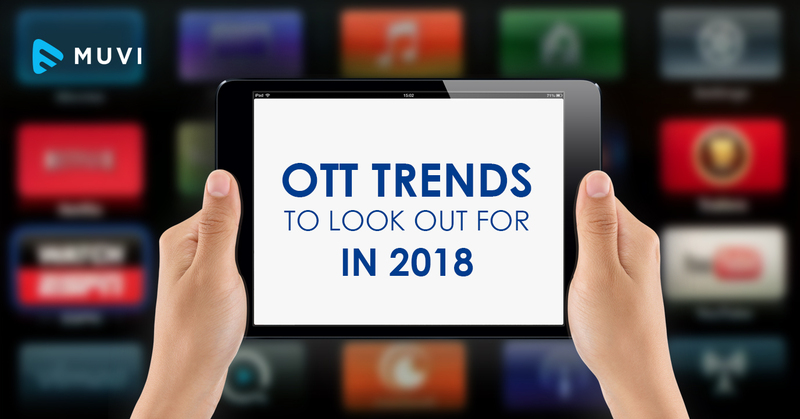 While OTT services, in terms of subscribers, have a long way ahead to get to a face-off with cable and satellite counterparts, in 2018 they certainly will have a strong foothold; thanks to the growing fondness for streaming services among the audience. With YouTube TV, Hulu TV, Sling TV, DirecTV Now, etc. doing exceeding well in their arena, this space is certainly is a place to look out for in 2018. If anyone disagrees with the above statement, then show them Netflix’s total expenditure on acquiring and creating content. It stands at a mammoth $6 billion. Last year, a lot of original content graced Netflix’s, Amazon Prime Video’s, and NBC’s content catalogue and mesmerized audiences with their production value, originality, and authenticity. Similarly, a number of shows could not make any mark and were outrightly rejected. The privilege called subscription is now solely dependent on content and most importantly original content. This has made streaming giants such as Netflix, Amazon Prime, Hulu, etc. to raise their bar when it comes to creating original content. While the OTT industry has become ginormous, increase in the number of players has also lead to cut-throat competition. Simply put, industry giants are leaving no stones unturned as far as increasing subscription base is concerned. The year will see several merging and acquisitions with industry biggies at the helm of it. Last year ended with the historical Fox acquisition by Disney and Netflix is also currently under the radar of Apple. 2017 is a year that every traditional Pay-TV provider will like to forget. According to a survey, one in seven Americans is a cord-cutter. So without going into the details of the dismal performance of the cable TV and Pay-TV providers, we can only hope they come up with some revolutionary tactic to counter the popularity of OTT services. However, it is highly unlikely that anything of that sort is going to happen in 2018. It wouldn’t be a surprise to see every major television company launching a dedicated streaming service as the year moves forward. Industry giants such as Amazon, Netflix, Hulu, etc. will continue spending on content and on technology to expand their subscription base. OTT videos will become cheaper and competition will only make the industry better. For consumers, the choice will matter more than the price. Consumers won’t mind spending a few extra bucks for premium content, but the catalogue and the overall service must meet the user’s expectations. Otherwise, there is no looking back.